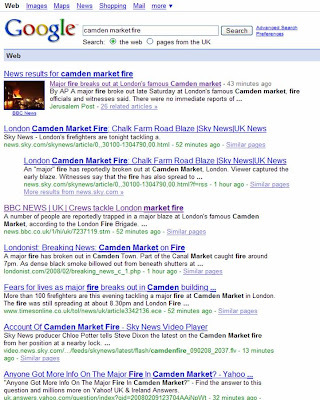 The top Natural Search result for 'Camden Market Fire' is not from the BBC or Sky News though - it is from the Jerusalem Post! At first I didn't realise the link was for an international publisher. I saw the headline 'Major fire breaks out at London's famous Camden Market' and clicked on it. Via Google, a news publisher from over 2000 miles away told me what was happening less than a mile from my home. This shows how important good SEO strategy should be for news publishers! As this was so close I decided to go and look for myself. I assumed the role of Citizen Reporter and went to take photos of the Camden Market Fire. Most of the area around the Camden Market Fire was sealed off, so I took some photos and came home. As I was leaving I saw professional photographers running towards the scene and since leaving a news helicopter has started circling - Sky News now has a continuous broadcast.